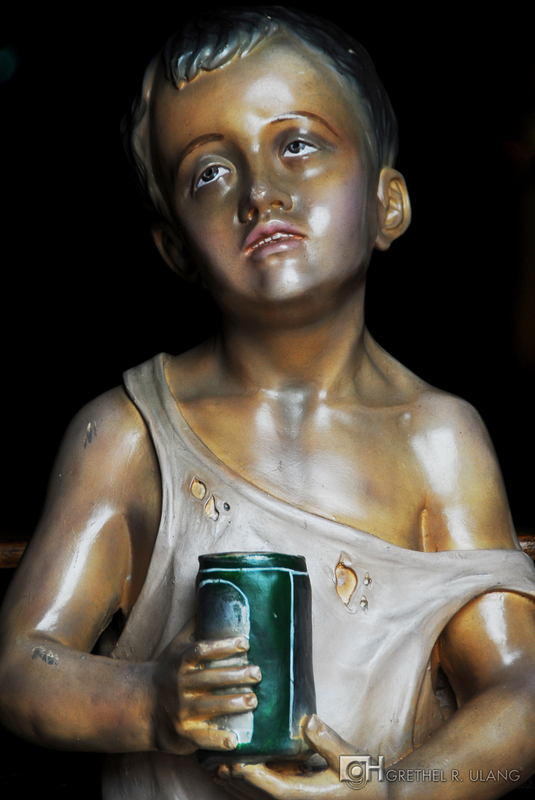 Finding Solemnity and ‘Pondo’ Boy | the unbearable lightness of being me. ← A Peek of Mount Mayon’s Peak. Somebody from the group mentioned that if it’s your first time to visit a church you have to make a wish, and another seconded the belief. Being a catholic who came from catholic schools, it made me wonder for a while why I never knew the said belief. 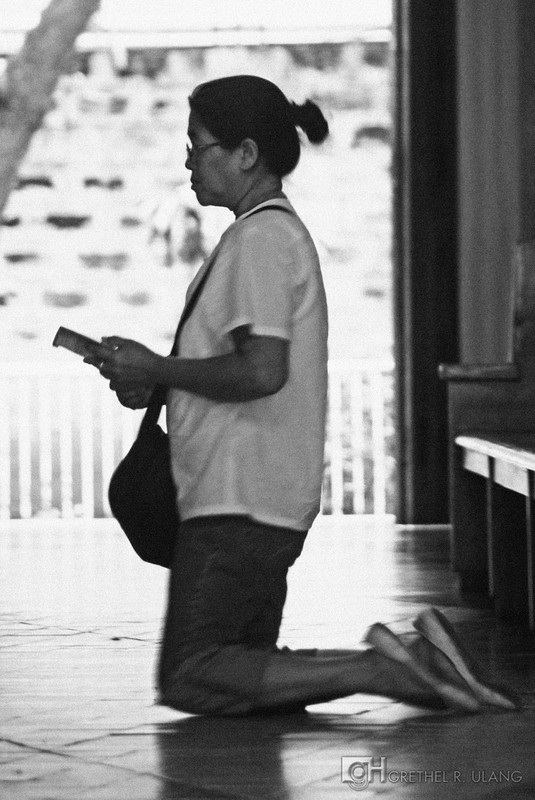 What I remember when I was still practicing religion was my instinct telling me every time I get inside the church to get down on my knees and pray. Maybe that’s the same thing, somehow. Our next stop was the Nuestra Sra. De Guadalupe, still in Makati area. Of the five churches we went to that day, I say this one has the impression of being a snob. Just by entering the spacious patio the scent of exclusivity is well in the air. Not one vendor is in sight. With the church elevated by an eight-step stairs from the expansive patio and exposed to the open sky, add a bit of clouds in the background – this definitely is one of the best wedding venues best for pictorial. And true enough, we were told not to be long inside the church because a wedding will be held. Constructed in the 16th century and rebuilt in the 18th after earthquakes and fire, the interior was modernized by the white drapery-like ceilings. 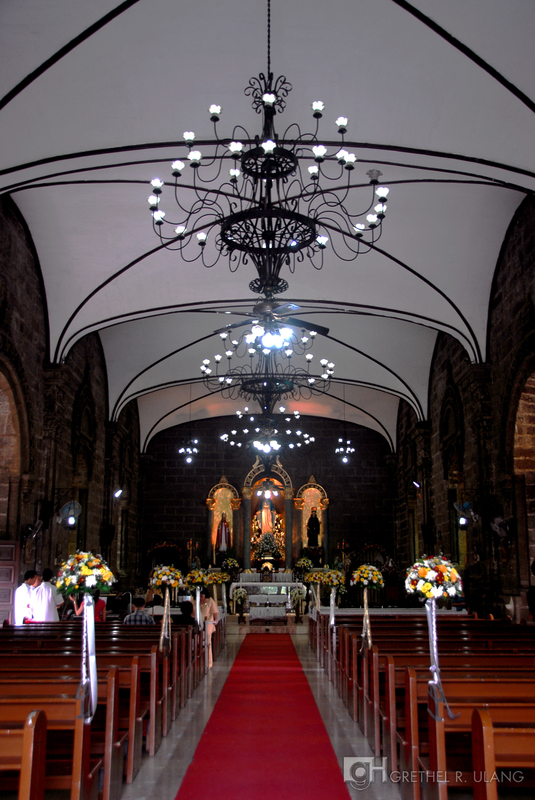 I thought of going closer to the altar but it’s already made up and, together with the aisle, was just awaiting the arrival of the bride and groom and the celebrants. By which I gathered meant: you have no significance to the event… you’re not allowed to go near the altar so it’s better to head out. 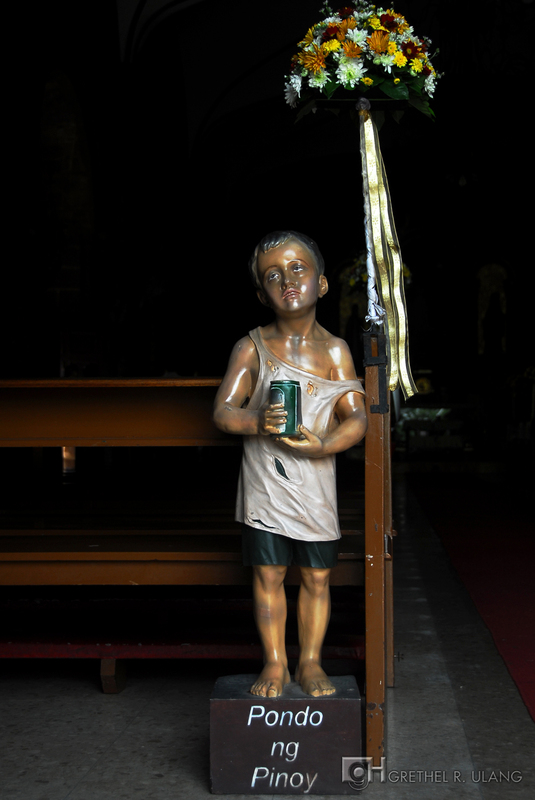 But before I went out, standing near the entrance at the end of the left side of the pews is the glossy, concrete-made ‘Pondo’ boy. 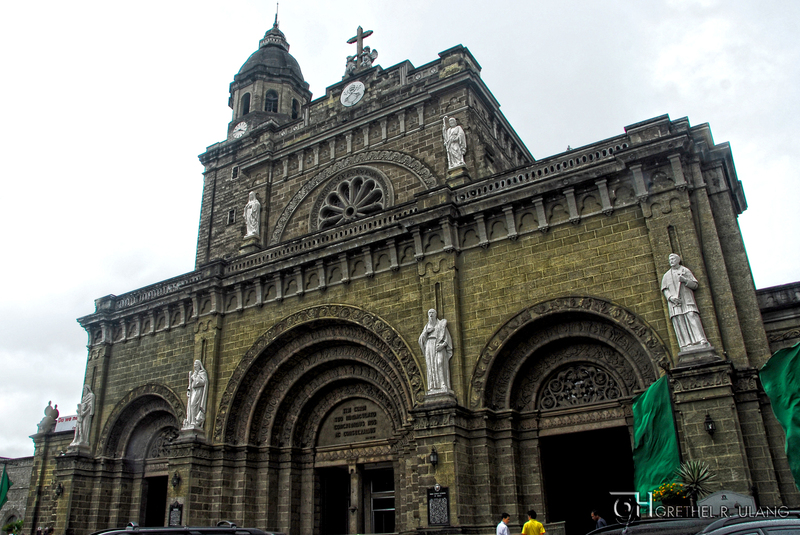 The National Shrine of Our Mother of Perpetual Help was the third on our list. 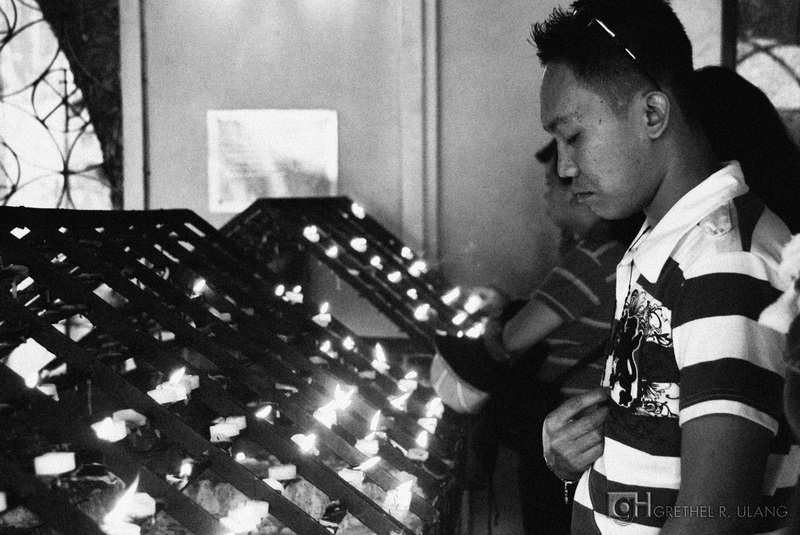 Simply and famously known as Baclaran Church, it is always flocked with hundreds of devotees. 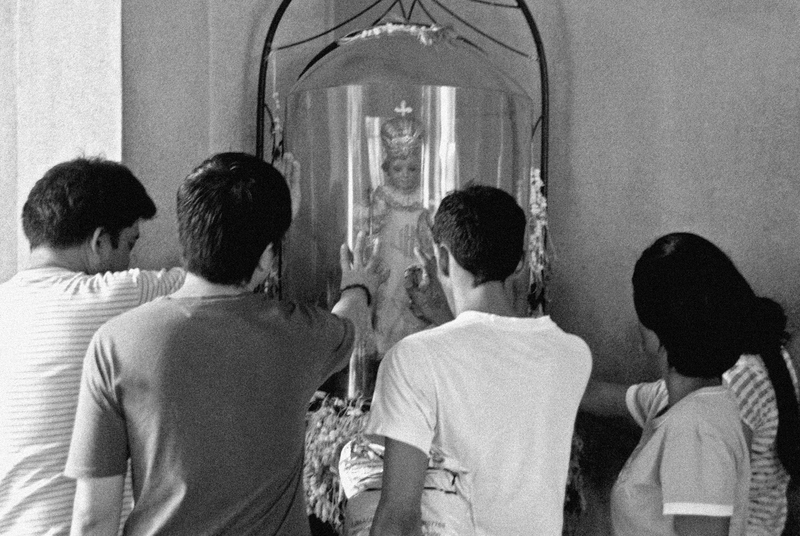 And this day was no exception – I guess finding Baclaran with just twenty or less devotees is one miracle that will never materialize. The first time I came here was many years ago, my mother took me with her. It was probably a Friday or a Wednesday because the church was suffocatingly full. A mass was going on and I thought: my mother must be really serious with her petition. I mean, why the need to rub bodies with strangers and trade smells with them, right? So I lighted a candle with her and prayed that her prayer be answered. After that, we bought a kilo of lychees then went home. Well, unlike the four churches we visited this is a church that was built in the 20th century. Just how the building was structured is so modern and not so much embellishments adorn the interior. 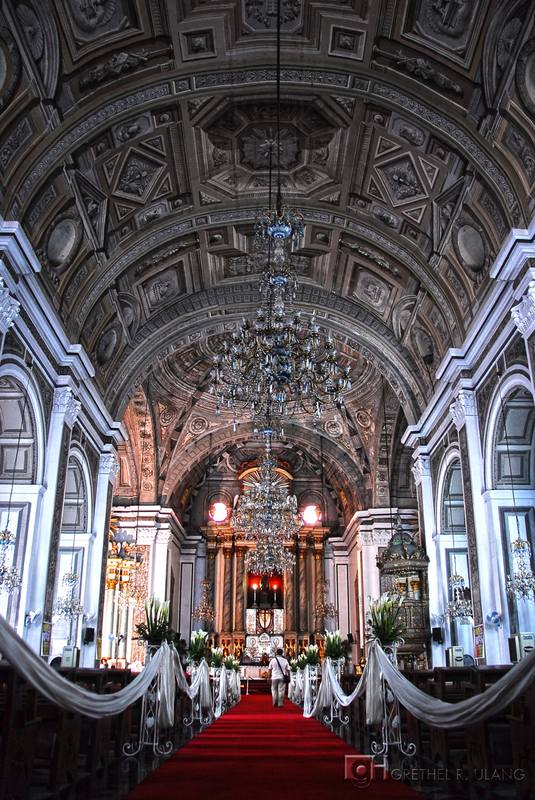 The center of the devotees’ belief, which is the famous framed image of Our Mother of Perpetual Help, is mounted high above the altar that is plated in unusual silver. Not much images of a saint are in sight. Just the big crucified Christ near the entrance, a small Sto. Niño enclosed in a glass on one corner and I think farther up front on the left is an average size image which I didn’t bother to check out who – another one probably stands on the right side. Even ‘Pondo’ boy is not around, or maybe I just missed him. With the long lines of pews, plain concrete pillars and columns and lots of open doors on each side I’d say this church was really built for the people who will flock from everywhere. With how the world is revolving today and the rate life is going, people need something to hold on to. And this I believe is what this shrine is all about. 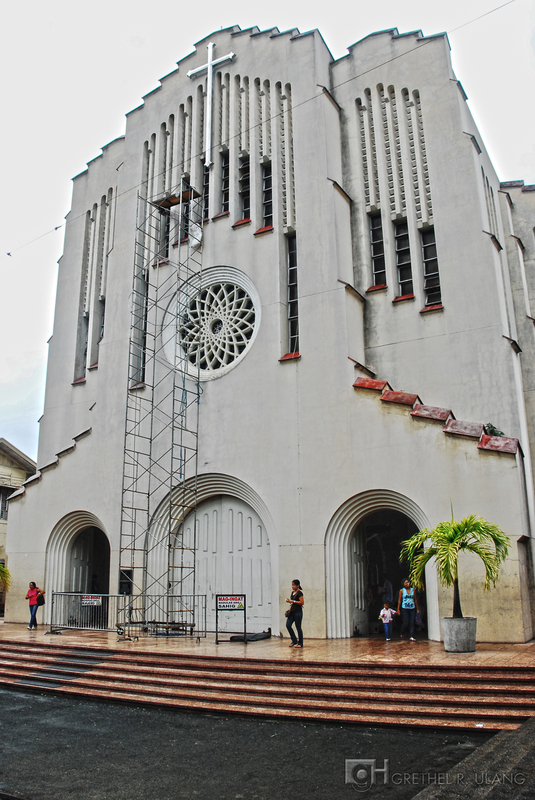 It was drizzling when we left Baclaran Church and the drizzle turned into rain as we approach the Cathedral. 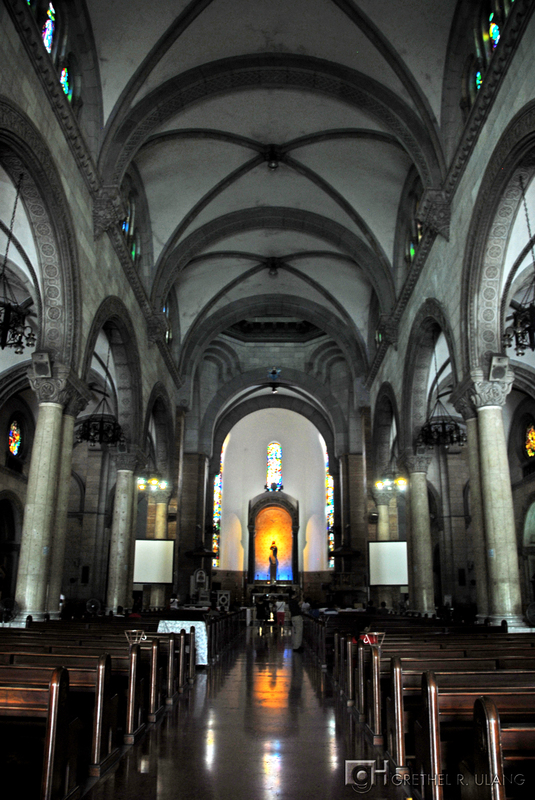 Manila Cathedral, Basilica of the Immaculate Concepcion, the mother of all churches and cathedrals in the Philippines, one of the famous landmark and tourist spot in Manila. I’ve been here many times but I have yet to see the inside of this church with the lights on. Every time I get here it’s dark, it feels so mysterious… as if it’s hiding something. The cathedral, probably, is on a constant “earth-hour” mode. But I guess it’s perfectly okay since the darkness emphasizes the magnificent and exquisite stained glasses all over the place. Several tourists were also there. Near the entrance laid out a table selling religious items – I never imagined that selling inside the cathedral was allowed… oh, well. I didn’t go around much; it’s too dark for my camera anyway. I would have preferred to shoot outside but a heavy downpour was on the loose. Just when I was about to go out and head back to the van I saw ‘Pondo’ boy standing at the foot of one enormous column. And that completed my visit. 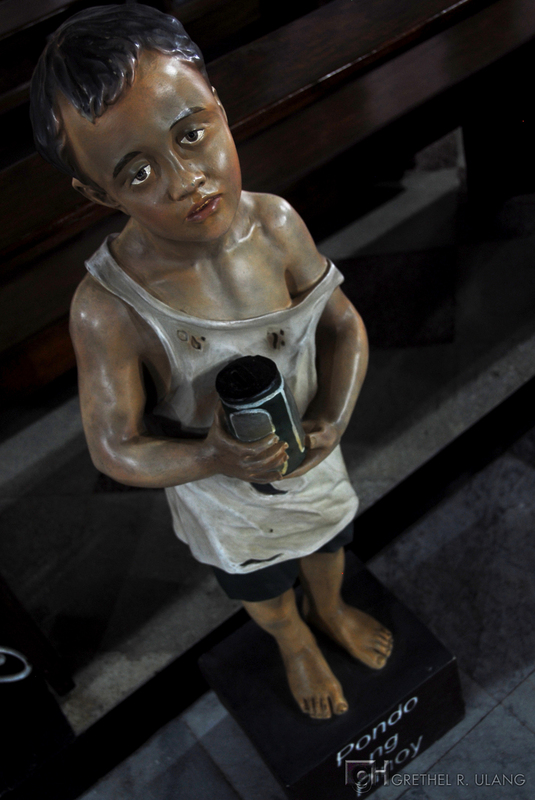 I tried to guesstimate the number of churches all over Metro Manila – each with this life-size ‘Pondo’ boy. There could be at least 300 ‘Pondo’ boys made and guesstimating the cost for each – that could have fed numbers of hungry kids… I was just thinking. 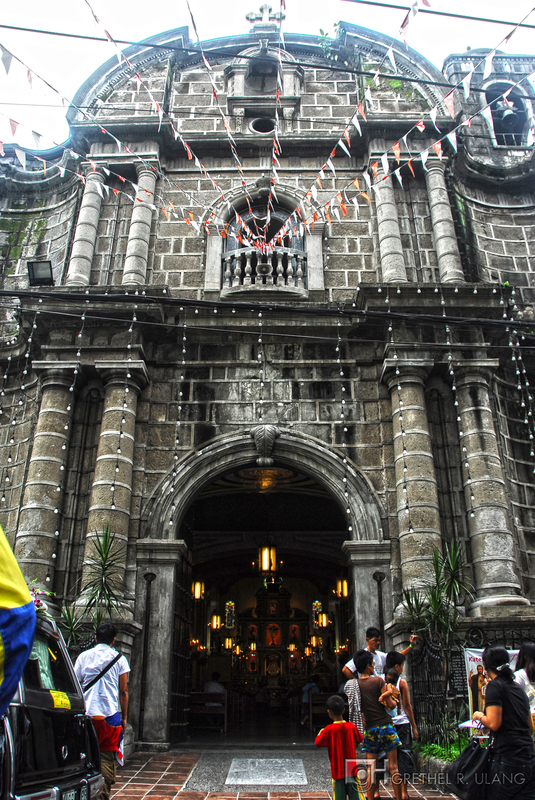 Sheltered by the city walls of Intramuros, a walk away from Manila Cathedral and marked as a World Heritage Site by Unesco is the oldest church in the Philippines, and a top-pick for couples planning to get married. 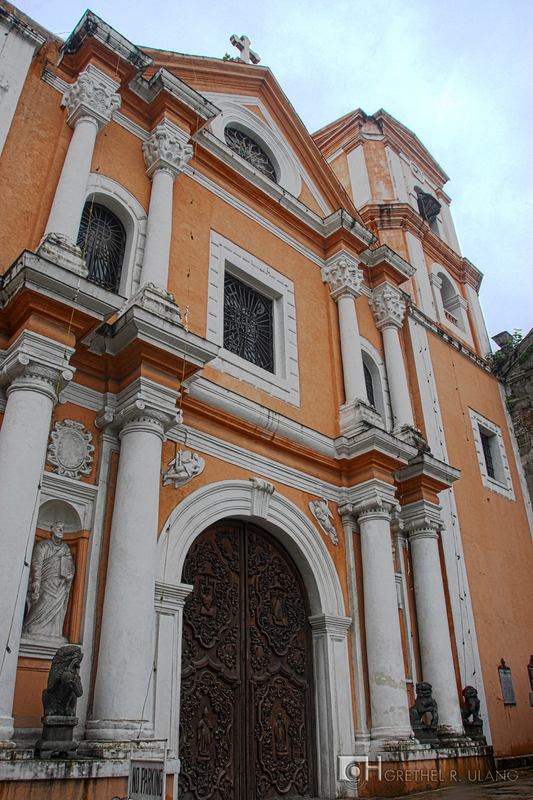 The San Agustin Church – one word to describe it: rich. 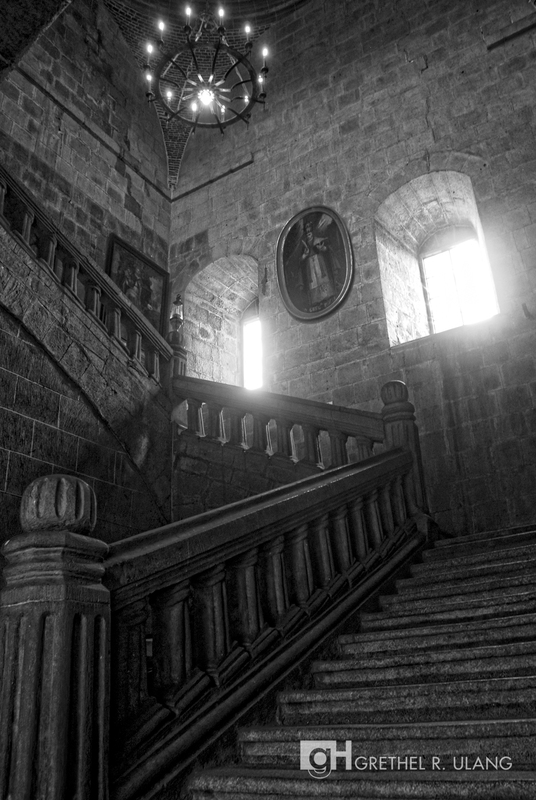 I was awed by the grandiosity and elaborate design when I looked up the ceiling, which matches the walls and pillars. 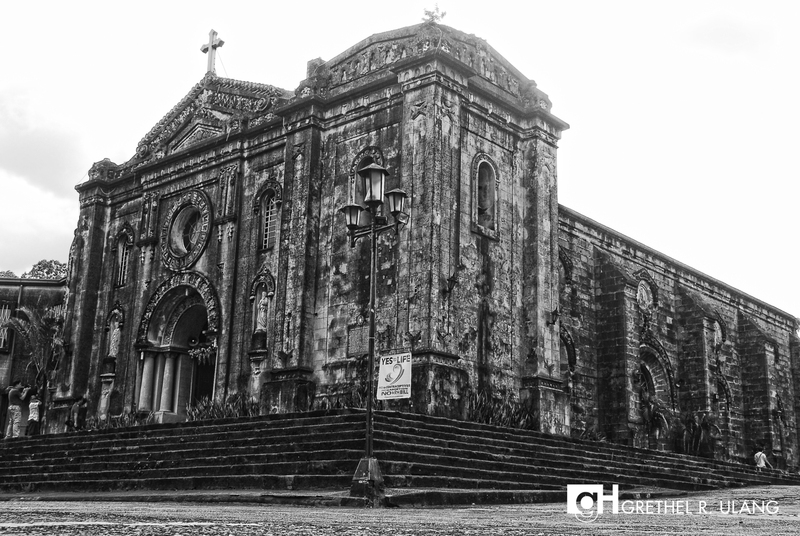 After centuries in existence, I think it needs more than wealth to safe-keep such heritage. Add the fact that it houses a museum of antiques and more heritage treasures. 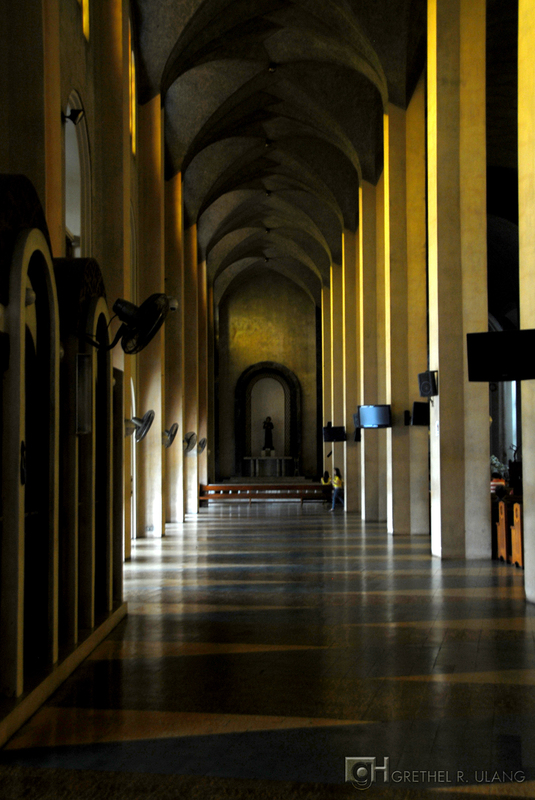 I’ve been to this museum before but my first time to get inside the church itself, so I decided to just linger there. A baptism ceremony was being held on the other side and a few people were trying to have a wedding rehearsal or some kind of. Dawdling around I can feel the eras that this church had witnessed. I began to picture the Spaniards and “illustrados” (the women with their “belos” swaying to every strike of their “abanicos”) hearing mass in Latin. 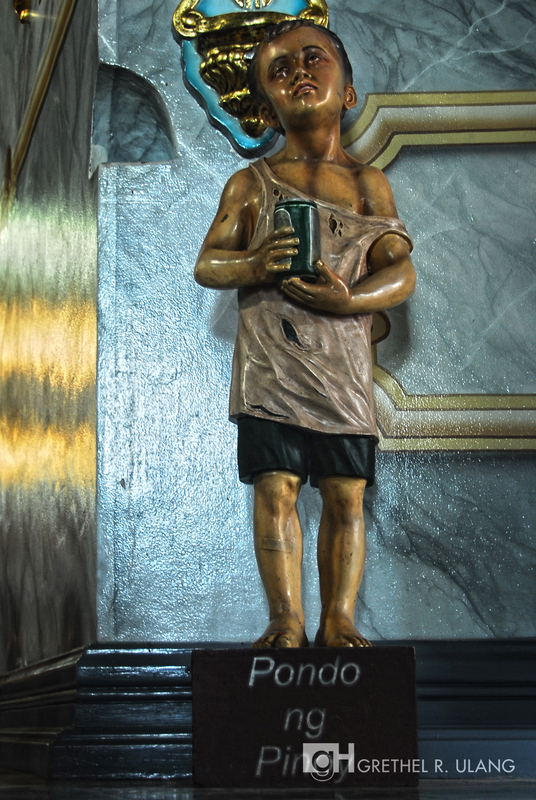 Since I don’t understand Latin, I moved on and found ‘Pondo’ boy at the end of the pews beside the statue of St. Agustin. Nice. 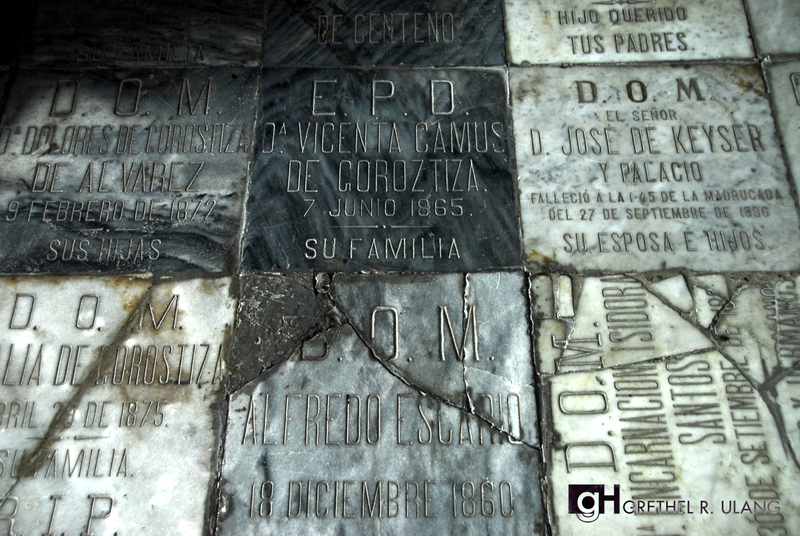 Then I was in this section at the left side where tombstones of different people were pasted side by side on the floor and some are mounted on the wall. Well okay, perhaps another way to raise funds… and I am just thinking. Yes, I was wrong to assume that I wouldn’t find solemnity in this trip. I just wouldn’t find it in me now, not when my prime purpose to go to a church these past years was to take photos and other times to attend to a certain event. And yes I found it many times before, even in a not so known, simple church listening to the priest’s sermon and chanting with the church’s choir. And yes, I found it in this trip. 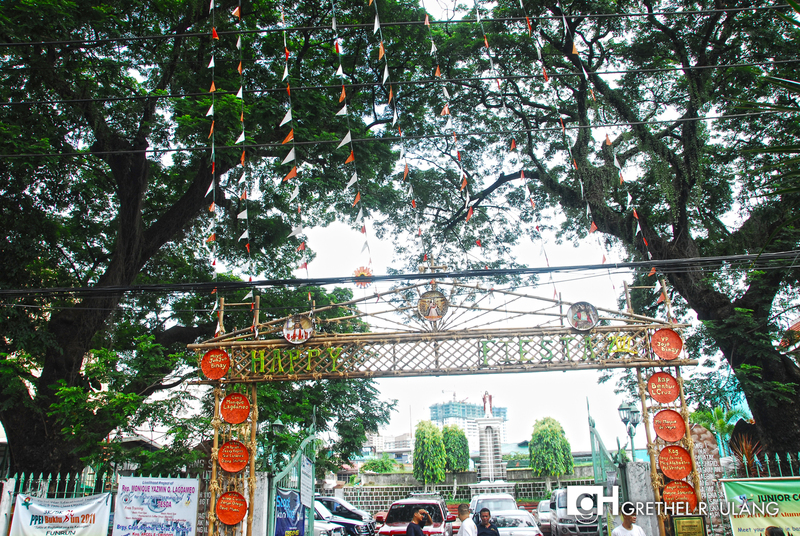 At the people who flocked Baclaran Church – who, I guess, many could be living from afar. I saw it in those women who were down on their knees while walking towards the altar. 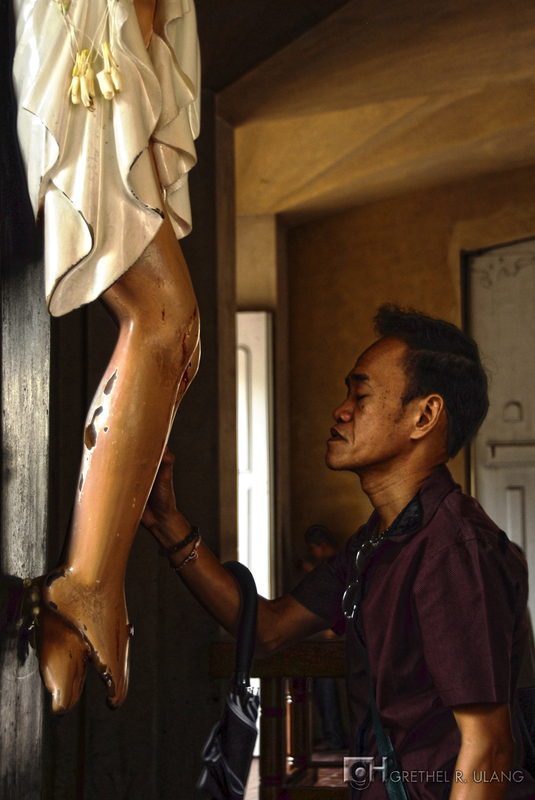 It’s in the touch of their hands to the feet of a crucified Christ as they mutely say their prayers. I saw it in the closed eyes of those standing in front the rows of their lighted candle. 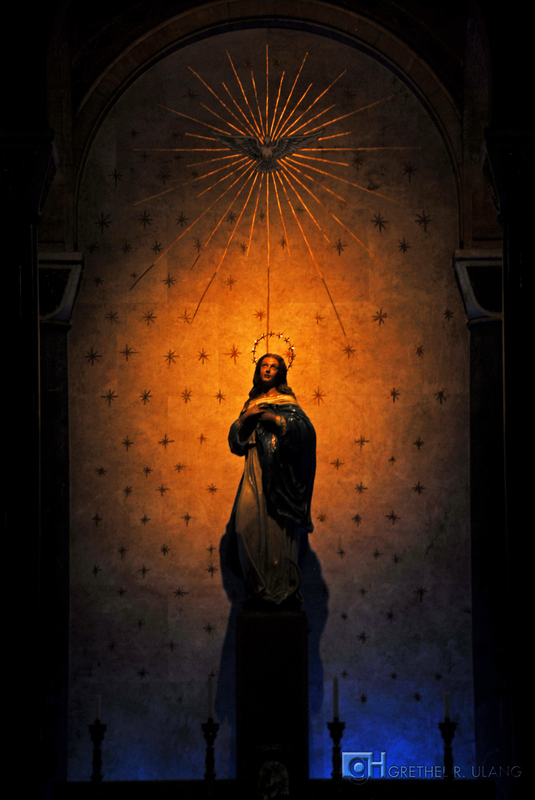 Yes, it’s in them; and of course I feel them… I still am a Catholic after all. Great photos. I like your photographs..
Beautiful, haunting images, my friend. Youre so cool! I dont believe Ive read anything like this before. So excellent to uncover somebody with some original thoughts on this subject. Thanks for beginning this up. This weblog is some thing that is needed on the internet, an individual with a small originality. Great job for bringing some thing new to the world wide web! thank you, that is such a wonderful thing to say… so overwhelming, super thanks! How is it that just anybody can write a weblog and get as popular as this? Its not like youve said anything incredibly impressive –more like youve painted a pretty picture over an issue that you simply know absolutely nothing about! I dont desire to sound mean, here. But do you truly think which you can get away with adding some fairly pictures and not really say anything? Great weblog! I dont feel Ive seen all of the angles of this subject the way youve pointed them out. Youre a accurate star, a rock star man. Youve got so much to say and know so a lot about the subject that I believe you ought to just teach a class about it…HaHa! I have to express my thanks to the writer just for rescuing me from this particular scenario. Right after browsing throughout the internet and finding thoughts which are not pleasant, I was thinking my life was over. Living minus the approaches to the issues you’ve solved as a result of this report is a crucial case, and those that might have in a wrong way affected my career if I had not come across your web site. Your actual talents and kindness in playing with all things was priceless. I’m not sure what I would have done if I hadn’t encountered such a step like this. I can at this moment look forward to my future. Thanks very much for this professional and sensible guide. I will not think twice to suggest your blog to any individual who would need guide on this problem. such an overwhelming feeling that this post affected you positively. thank you, from the bottom of my heart… wishing you all the best this life could offer. to life!